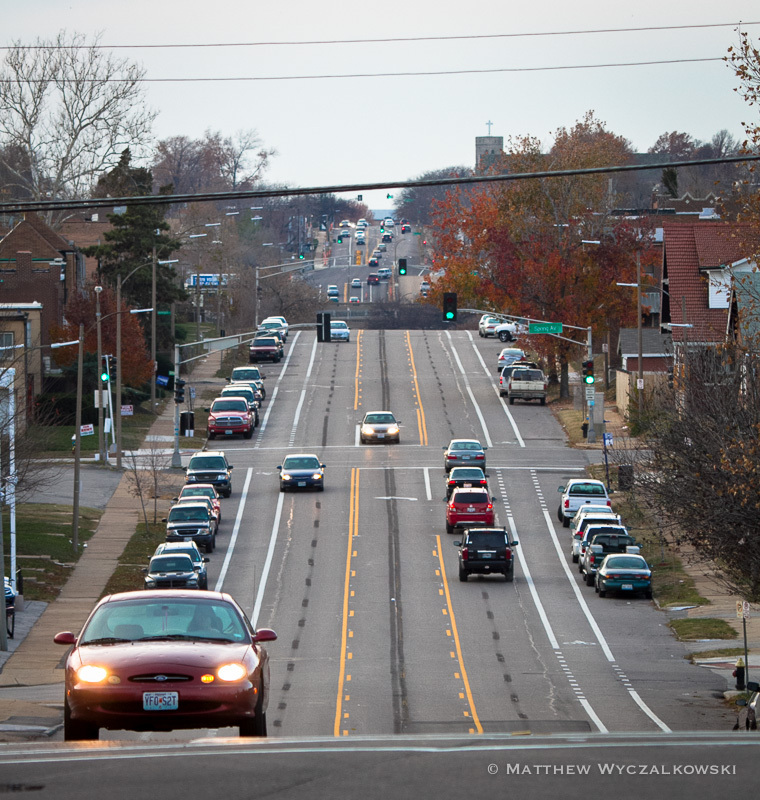 New bicycle lanes have been laid on Chippewa St. between Morganford Rd. and Grand Blvd. 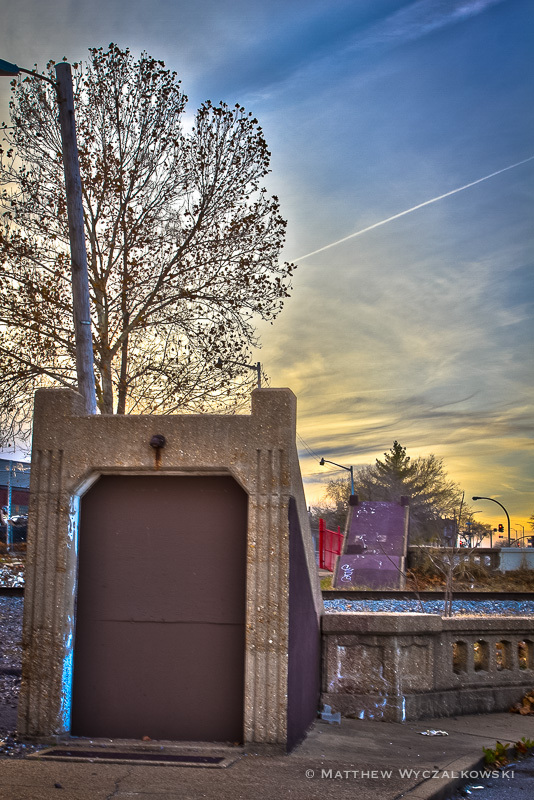 in South City. 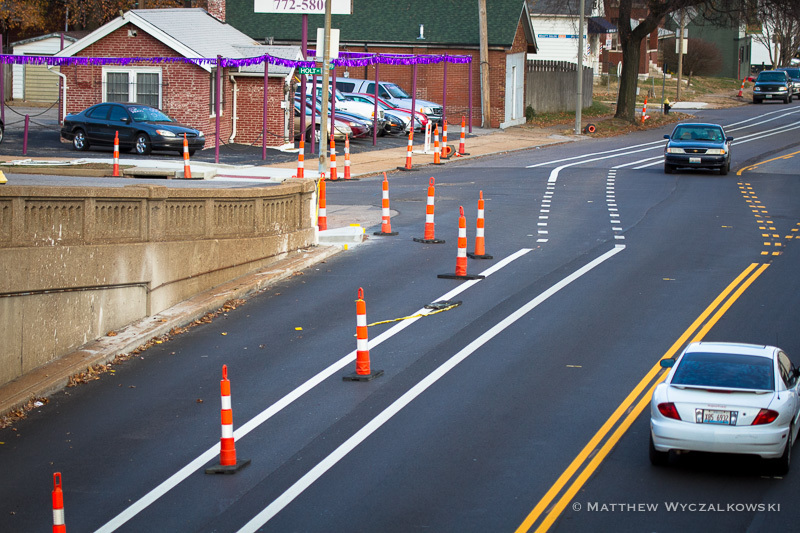 Below are a few photos, descriptions, and opinions of this latest addition to St. Louis bicycle infrastructure. Westbound Chippewa at Grand. Car travel lanes have been reduced from four to two with a center turn lane, and bicycle lanes have been added in both directions. 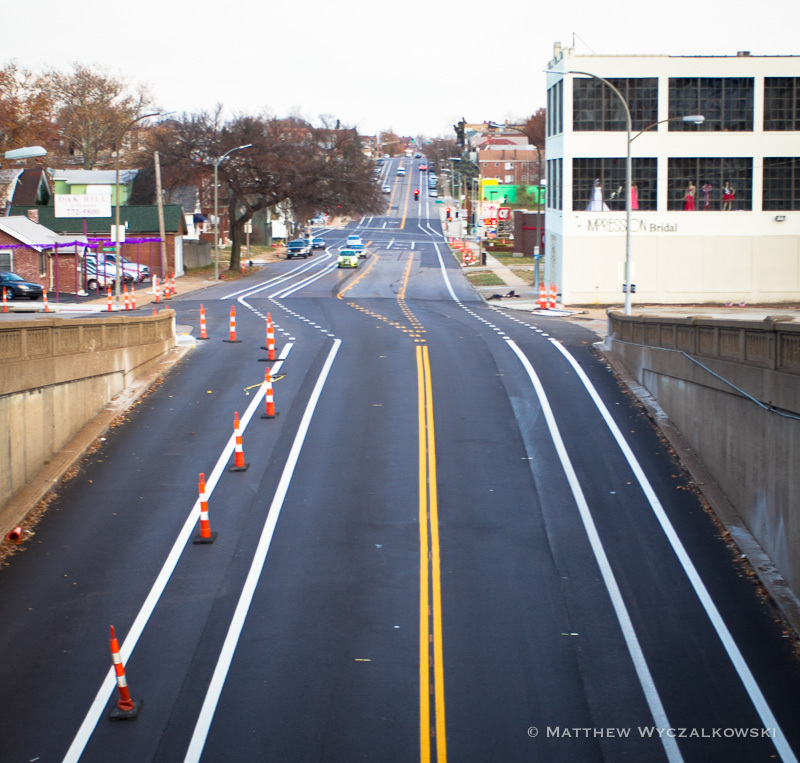 We cycled and drove this newly configured section of Chippewa, and our initial impression is a positive one. The new lane configuration is effectively a road diet and helps moderate traffic speeds. The bike lanes are a welcome addition and generally seem well laid out, although a buffer strip between the bike lanes and parked cars (like on the Arsenal bike lanes) would have been appreciated. While riding along Chippewa we spoke to an occasional cyclist who rides on this stretch: like us, he appreciates the lanes and the guidance they provide for both cyclists and drivers. The pedestrian lane under the viaduct seems like a creative and appropriate solution to the problem of pedestrian connectivity along aging infrastructure. It is important that the pedestrian lane be separated from automobile traffic, and the traffic cones are obviously a temporary fix. We look forward to seeing the permanent configuration, and will update this post as the project evolves. 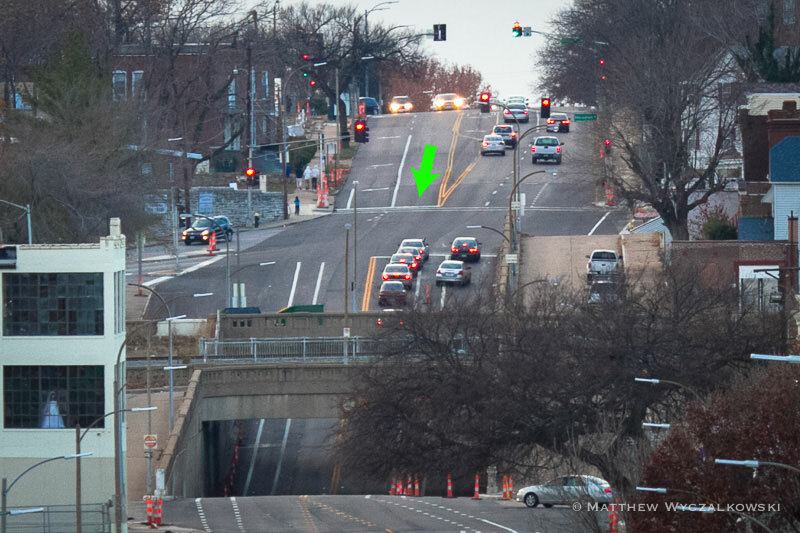 The principal concern we have is with the approach to the Meramec intersection along eastbound Chippewa, pictured above, where the right lane turns right while the left lane is straight through. 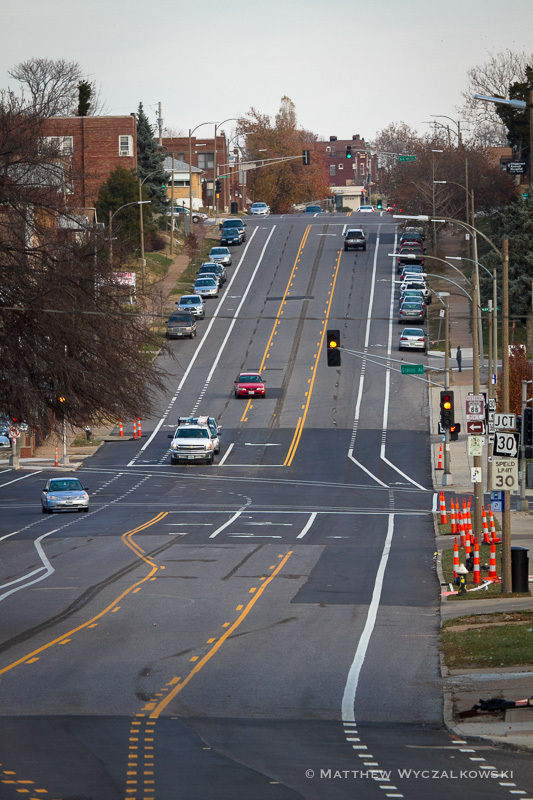 As a cyclist — whether a novice or an experienced rider new to this area — it can be difficult to know where to position yourself, and visibility of the hilly intersection is limited. Our sense is that the best place for cyclists eastbound on Chippewa is in the left lane (with the through-going traffic), but there is no guidance for cyclists to indicate this. Left lane sharrows and possibly signage indicating to cyclists the best way to negotiate this unusual intersection would be very helpful — suggested sharrow placement is indicated with green arrow in the photo above. While the project is not yet finished, it seems that it is a significant step forward in improving accessibility and connectivity for pedestrians and cyclists alike. 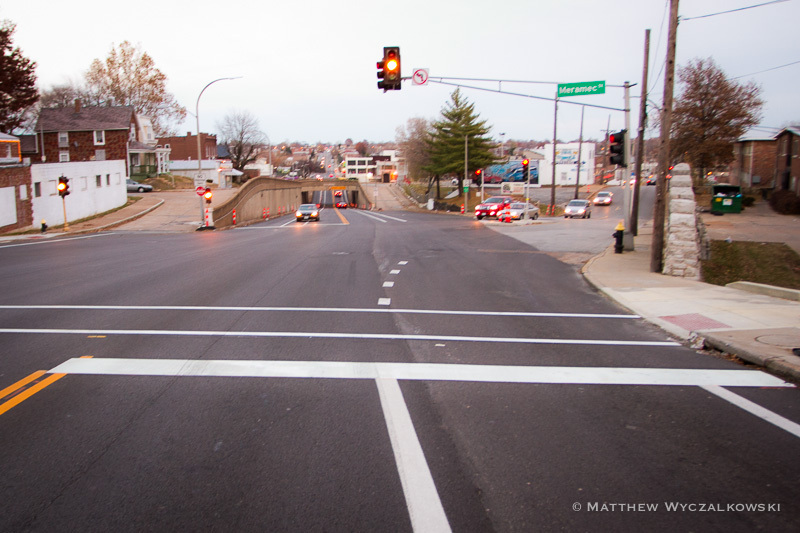 Thanks to MODOT and the Streets Department for a useful and positive contribution to St. Louis bicycle and pedestrian infrastructure. What is the configuration of the west (south?) bound lane under the viaduct, working from center line out to the curb? More specifically, what is the “lane” under the viaduct that nestles right next to the curb? It’s wide enough for a car to drive in, which means that when traffic gets backed up, drivers will drive in it. Not only will they drive in it, but they will drive fast in it. The concept is a nice try, but I wish MoDOT would try to be consistent. There is being “contextual” and then there is simply too much variety. 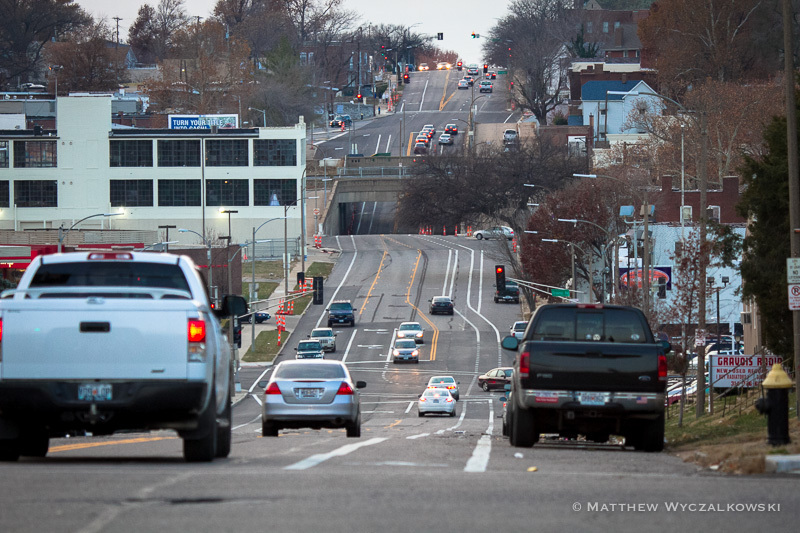 I think MoDOT’s application of bike lanes has too much variation, both in design elements and in placement on the roadway. It just makes it look like they have no clue what they’re doing. Chris — sorry if the post was unclear. The wide, rightmost westbound lane under the bridge is a pedestrian lane. It is an ADA-compliant (guessing here) replacement for the pedestrian staircase passage which is now closed. The cones are temporary, and more permanent barriers (bollards? I don’t know) will be installed soon. My understanding is that a grade-separated walk, like a sidewalk, may eventually be installed. I’m happy to see that the city is creating more cycling infrastructure. It’s very badly needed and a long time coming. And this looks more promising than what they did on Manchester. The physical barrier around the pedestrian area under the viaduct is a definite necessity as I can see motorists being unclear on the purpose of this ‘lane’. I think along with this, the city needs to push more motorist education as the safety of cyclist really depends upon it. AMEN ON JENA’S LAST SENTENCE, “the city needs to push more motorist education as the safey of cyclist really depends on it.” YES YES YES YES YES. Sadly, *THAT* effort is non-existent, because the organization pushing for the adoption of these segregated facilities is NOT pushing for education of motorists OR cyclists. Please, Jena, contact your legislators, Trailnet and Great Rivers Greenway to INSIST on educational components.